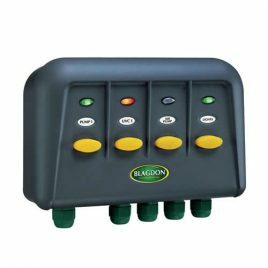 Blagdon 4 Way Switch Box is a completely new range which ensures that the Blagdon Powersafe switch boxes are not only the best quality switch boxes on the market with unique innovative features, but also the best value switchbox on the market. 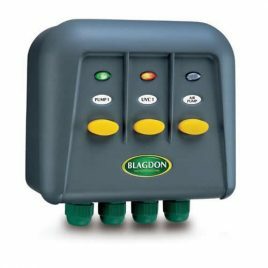 The Blagdon Powersafe weather proof switch box makes easy work of connecting pumps, lights, Ultraviolet's and other electrical equipment in and around your pond or garden. Blagdon 2 Way Switch Box is a completely new range which ensures that the Blagdon Powersafe switch boxes are not only the best quality switch boxes on the market with unique innovative features, but also the best value switch box on the market. 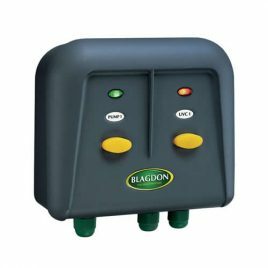 Blagdon 3 Way Switch Box is a completely new range which ensures that the Blagdon Powersafe switch boxes are not only the best quality switch boxes on the market with unique innovative features, but also the best value switch box on the market. 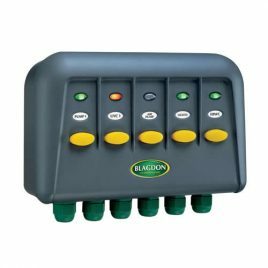 Blagdon 5 Way Switch Box is a completely new range which ensures that the Blagdon Powersafe switch boxes are not only the best quality switch boxes on the market with unique innovative features, but also the best value switchbox on the market.